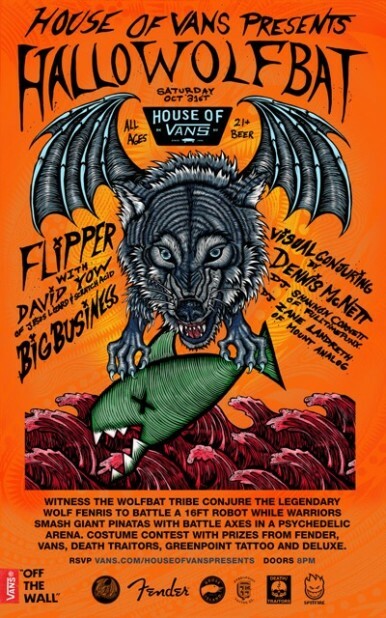 House of Vans Presents: Hallo-Wolfbat — A Visual Conjuring by artist Dennis McNett. Vans and McNett collaborate with special guests to transform Brooklyn’s expansive 25,000 square-foot House of Vans event space into an enthralling psychedelic arena fueled by fantasy and spectacle, and brought to life through ethereal visual art concepts, exploits from creatures of another world, and wild musical performances. Live sets include performances by the legendary punk and noise rock band Flipper with new front man David Yow (of Jesus Lizard and Scratch Acid), sludge metal band Big Business, DJ Shannon Cornett (of LA’s fulltimepunx), and DJ Zane Landreth (of Mount Analog). Visions of 16-foot robots and ferocious wolves in a battle royale await you. Don’t miss this nightmarish dream come true, one night only. Dress in your Halloween best and arrive on-time for a Costume Contest with prizes from Fender, Vans, Death Traitors, Greenpoint Tattoo and Deluxe. Cold beverages provided by Goose Island. Tags: art, free beer, FreeNYC, House of Vans, Music. Bookmark the permalink.